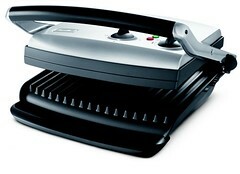 The Gourmet Health Grill™ – This professional quality contact grill cuts out the fat to create delicious healthy meals. It features a 1500 Watts Extreme Heat System – the cooking plates reach up to 420 F (215 C). The 11 x 13 inch cooking surface is coated with a premium non-stick coating. 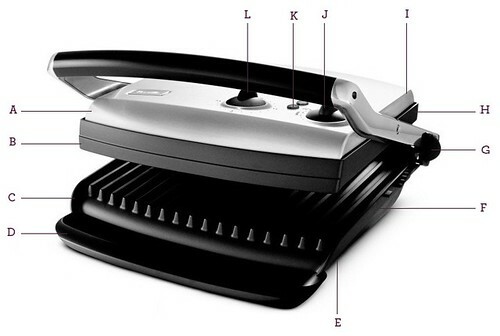 It has a variable heat control and the floating top plate has an adjustable grilling 5 level height control. The TG890TXL has all the benefits of the TG870XL Gourmet Health Grill™ as well as a timer so your food grills perfectly every time. E. Extendable Feet. F. Non-Stick Ribbed Bottom Cook Plate. G. Adjustable Grilling Height Control. H. Non-Stick Ribbed Top Cooking Plate. I. Floating Hinge Top Cooking Plate. J. Variable Temperature Control Dial. K. Power 'ON' and 'READY' Lights. L. Adjustable 15 minute timer.